Cleaning isn't all that fun. Are you with me? I take it there are people who enjoy cleaning, but I'm not one of them. But I do like a clean and shiny house. (And once in a while it even happens.) 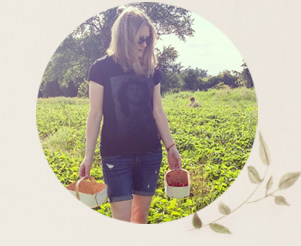 What helps to motivate me is having products at the ready that are pleasant to use, safe for my family and the environment and effective at doing the task at hand. 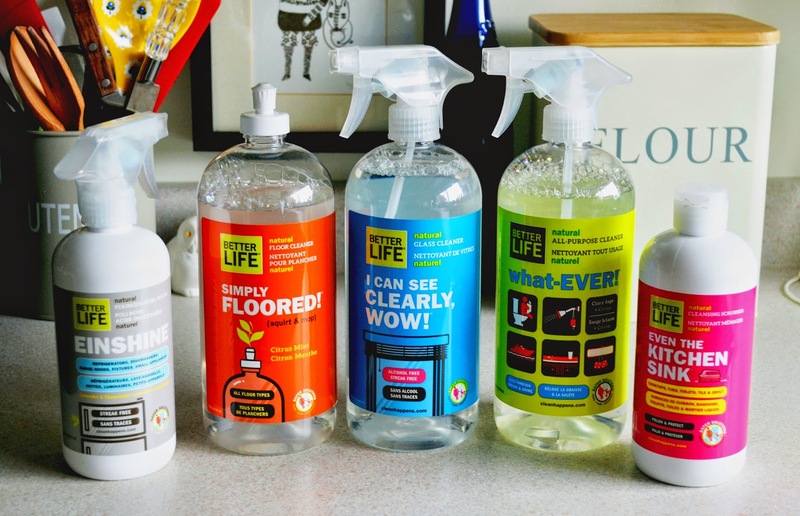 Recently, Better Life brought its range of natural cleaning products to all 130 Canadian Target stores. So, while I'm shopping for great non-leather, size 11 (yay!) boots and shoes at Target, I can also choose from among 12 beautifully packaged Better Life cleaning products for my home. Better Life co-founders Tim Barklage and Kevin Tibbs (you may recall seeing them on ABC's Shark Tank) came up with the idea for a safe and effective cleaning line when they were both new dads, with babies crawling on the floor. Better Life products are derived from plants and naturally free of fragrances, sulfates and petroleum-based ingredients. No animal testing occurs at any phase of product development. Besides all that important stuff, the packaging is pretty and cheerful (almost makes me want to clean), the names are playful and the scents are really lovely - subtle, natural and not overpowering. 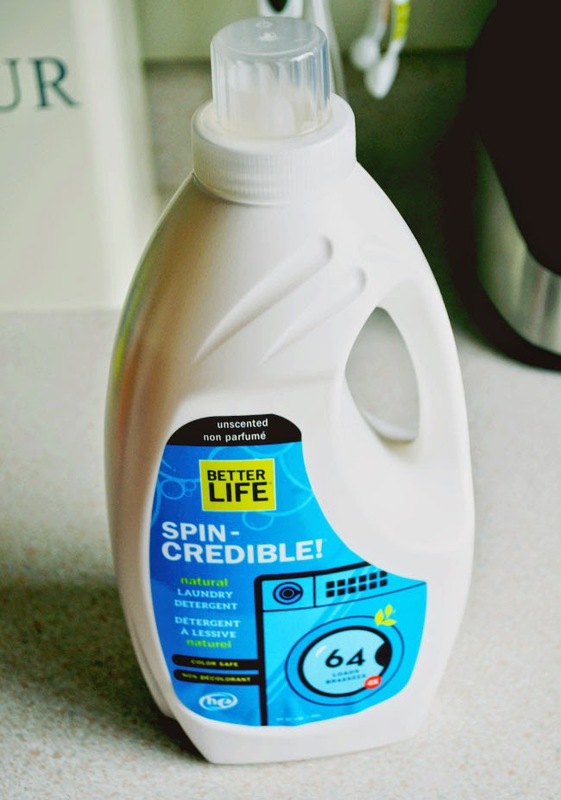 Some Better Life products are unscented as well, like this Spin-Credible Natural Laundry Detergent. You know how some "unscented" products still have a weird, kind of chemical smell? This doesn't. Spin-Credible also comes in the most lovely lavender-grapefruit scent. I have been using Better Life's what-EVER! Natural All-Purpose Cleaner in clary sage & citrus all over the place and it's so much fun to use. It also comes in unscented. I have to say the product I was most excited about is Even the Kitchen Sink Natural Cleansing Scrubber. It's often difficult to find a natural cleaning scrub on the shelves of the stores in my area, and I really don't like using those nasty, strong-smelling scrubs that are so famous. I find a cream scrub essential for brightening sinks and removing stains from countertops and tea cups. Even the Kitchen Sink took the tea stains off my favourite owl mug quickly and efficiently. 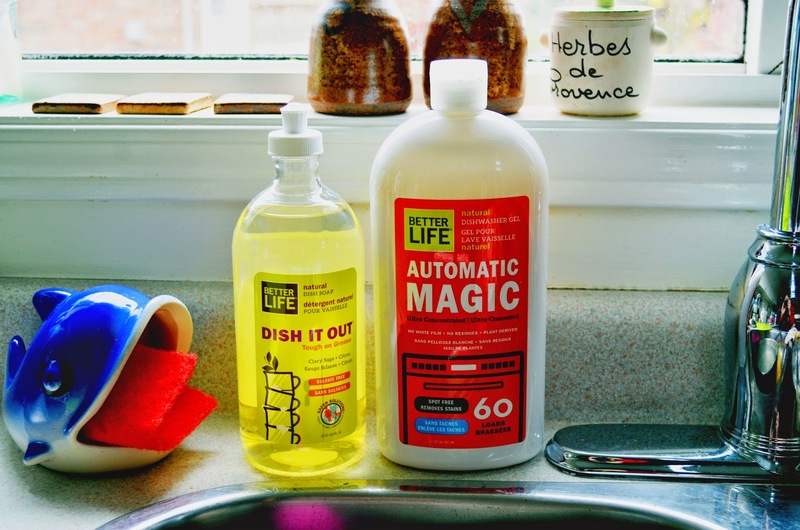 Better Life products at Target also include a glass cleaner, the fabulous, squirtable Simply Floored Natural Floor Cleaner, sulfate-free dish soaps, a granite cleaner and the brilliant Einshine Natural Stainless Steel Polish. To learn more about Better Life or to view the company’s full line of household cleaning items, visit www.cleanhappens.com. Win My Favourite Better Life Natural Cleaners! Enter to win using the rafflecopter below until November 24th. *I was provided with products for review purposes. All opinions are authentic and my own. Thanks for supporting the awesome companies that partner with Woman in Real Life! i now feel really confident about purchasing these products based not only on the cheerful packaging but the real life review. thanks! ....annnnnnd, to answer the question *headsmack* i would most like to try the all purpose cleaner. the name suggests a really great clean smell. I would use the what-EVER cleaning solution. I think that's the one they used in that Shark Tank video and thought, that looks interesting. I am looking forward to try Spin-Credible Natural Laundry Detergent. But really all of them. I would most like to try the Spin-Credible Natural Laundry Detergent. Spin-Credible Natural Laundry Detergent is what I would try first but all products I would use and love! 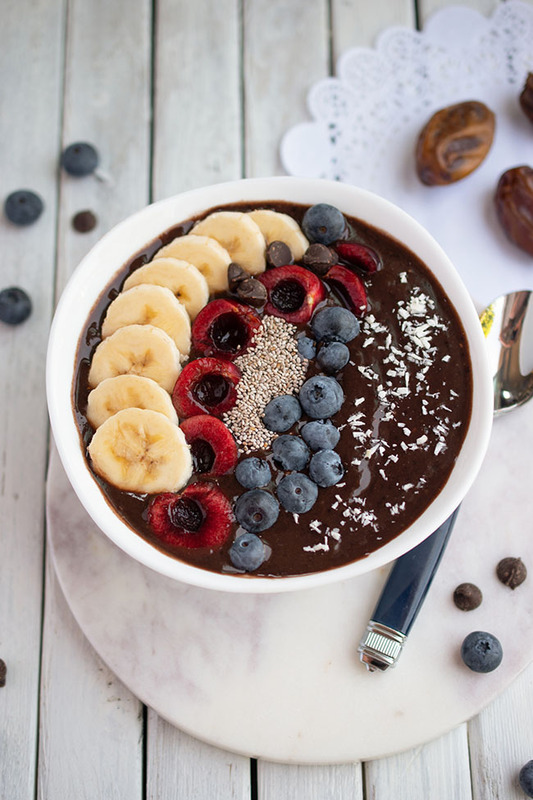 I would love to try the What-EVER! Natural All-Purpose Cleaner. I would like to try Spin-Credible Natural Laundry Detergent the most. I would like to try the Simply Floored because I have lots of baby grandchildren that spend hours down there crawling around. I would try all these natural cleaners, I have a sensitive chemical allergy to chemical cleaners, so anytime I can find all natural I'm in! I would be most excited to try the "Simply Floored" I have flooring in all of my house and no carpets so I would love something that works and is all natural. I'm most interested in the Spin-Credible Natural Laundry Detergent...The scent sounds lovely! The Spin-Credible Natural LAUNDRY DETERGENT and the Simply Floored! Natural Floor Cleaner sound amazing! Looking forward to trying the Natural Floor Cleaner. James is such a sucker for cleaning products... I'm just in denial of the whole issue ;) I do like in scented detergent! I would love the dish detergent, I am always looking for good, all-natural ones! I'd like to try the Automatic Magic. All of them - but definitely the what-EVER cleaning solution. I really want to try the Automatic Magic! I need to find a better cleaner! I would like to try the what-EVER! all purpose cleaner the most. I think I would like to try their What-EVER! Natural All-Purpose Cleaner at our house! I'd like to try the Even the Kitchen Sink Natural Cleansing Scrubber. I'd like to try the Unscented laundry detergent the most. I'm really sensitive to strong fragrances of my clothes so I'd love to see how this works for us. I'm most like to try the Spin-Credible Natural Laundry Detergent. I would like to try the Simply Floored! Natural Floor Cleaner because with have grandkids and animals that are on the floors all the time. I'm excited for the What-EVER! Natural All-Purpose Cleaner!! I'd love to try the Dish It Out dish soap! Bailey Dexter I would love to try the Simply Floored! Natural Floor Cleaner, I bought a 100 year old house with the original floors and I have been trying to get them back up to the way they were.